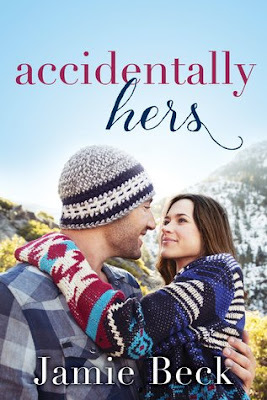 Accidentally Hers by Jamie Beck is the first book in Sterling Canyon series and also my first by the author. Story of Avery who has always been the sensible daughter and sister, is stuck between her family, with her parents always looking the other way and her brother who is always promising to forego his wayward ways that often land him in trouble, and Grey, the new ski instructor in town who meets an accident by her brother which forces her in a financial pickle. Determined to save her brother from prison, she just has to convince Grey to leave her brother alone but what she doesn't take into account are the sparks that fly when they meet. The book has a beautiful cover, an interesting blurb and an intriguing title which made me pick up this book. The plot is promising but despite this the story fell a little short, according to me. I could not warm up to Avery who is educated, independent and intelligent and still makes some decisions that seriously made me roll my eyes and question her intelligence. She displays no spine at times which was frustrating. Grey is nice and I think a bit too nice. I kept thinking that he deserved so much better than Avery. Avery's brother had me gritting my teeth and wanting to shake him so he understood the havoc he was causing in not only his but also his sister's life. Jamie's writing style is expressive but I think the characterization and events development could have been better. All in all, Accidentally Hers by Jamie Beck was a one time read for me. I wanted so much more from it and it has that much potential. 3 out of 5 to it. Despite my reservations about this book, I will be checking out the other books by Jamie in the future.